Fruit is plentiful over the summer months. Grapes, stone fruit and berries flood our supermarket and country stalls. In New Zealand we are encouraged, as part of the 5+ A Day Vegetable NZ promotion, to eat 3 servings of vegetables and 2 servings of fruit the size of our hand each day. Over summer it is easy to exceed these amounts. Although root vegetables such as potato, taro, kumara, parsnip and yams do contain more starch and their intake should be controlled by the overweight, leafy green vegetables; salads; carrots and pumpkin can be eaten in any amount. These vegetables are rich in vitamins and minerals many of which are anti-oxidants and good for our health. They are also bulky and high in fibre and soon fill us up, which in itself limits the amount we can eat. 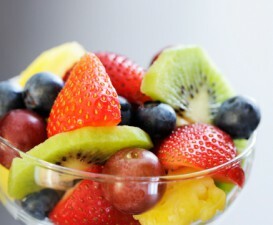 Fruit, on the other hand, does contain the sugar fructose. While providing a lower fat alternative to snacks such as cheese and crackers, muesli bars, chips, cakes and biscuits, care should be taken with the amount of fruit consumed each day. While Fructose has a low glycaemic index (GI = 20) it is more rapidly metabolised by the liver than glucose (GI = 100). High levels of fructose may lead to increased blood levels of triglycerides and lactate. This can be of concern to those who are overweight, diabetic or have elevated blood cholesterol levels. This issue becomes more apparent over the summer holiday season in New Zealand than at other time of the year. While on holiday people have more time to graze on fruit throughout the day. They may also drink more fruit juice and sparkling wines and beers which also increase sugar consumption and aggravate the problem. Previous Homocysteine and cardiovascular disease: folate to the rescue!